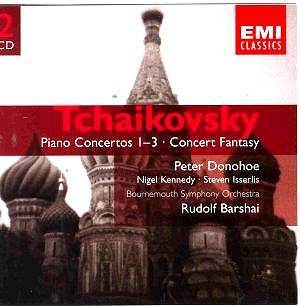 Having been won round to the Second Piano Concerto during the 1970s by Igor Zhukov�s Melodiya recording I have a special and possibly obtuse interest in the work. Zhukov adopted the Siloti cuts - Donohoe plays the work complete. I missed the Donohoe version first time around when it was part of his first access of pianistic fame in the 1980s. Although the Second Concerto was rosetted by Penguin and acclaimed by Gramophone I come to these recordings for the first time. The acoustic is very reverberant; listen to the decay at the end of the last movement of the Tchaikovsky First. The immersion of the Chopin-like ornamentation of the Concert Fantasy into this context produces a �swimmy� effect which is not ideal. This also afflicts the First Concerto. In a field that is rapaciously competitive you could not viably claim that this set was a library version. It is however typically exciting and Donohoe�s aptitude for brilliance coupled with a burly strength can never once be doubted. We are in another world when it comes to the Second Concerto. Not only is the sound picture sharper, stronger, closer, tactile and realistic but there is also an overwhelming sense of occasion. It comes as no surprise to hear that the Second Concerto was recorded first. The acclaim that recording met resulted in or affirmed a decision to record the complete cycle. When the life of Peter Donohoe comes to be written this recording will be seen for what it is - a landmark event. The first movement�s plunging celebratory mood contrasts with the soloistic andante non troppo laced with Tchaikovskian sentiment. Pre-cross-over Kennedy and pre-celebrity Isserlis create a contemplative reflective pool which exercises a velvety grip on the imagination. The exciting Allegro con fuoco flounces in with all flags flying and gallops along in a way that suggests Saint-Saëns� Second Piano Concerto. Exhilarating stuff. After a fallow period (at least so far as the catalogue is concerned) the present day Donohoe now moves into another phase with his British Piano Concerto series for Naxos. This was trailed by his Finzi and Walton contributions over the last couple of years. The British series started proper with his two Rawsthorne concertos but his Bliss concerto comes soon preceded by a concert performance in Birmingham. I do hope that he will be tackling the Bax Winter Legends, the Ireland, Arnell, Stanley Bate, Bowen, Alan Bush, Carwithen, Albert Coates (should be right up his street), Coke (reportedly Rachmaninov-like), Gipps, the pairs of concertos by Reizenstein, Merrick (old-fashioned) Josephs and Jacobs, Williamson (3), Wordsworth and intriguingly the five or so neo-Schumann concertos by Gaze Cooper. A chance to come to terms with possibly the finest Tchaikovsky 2 ever - an object lesson both as an interpretation and as a recording. If you need yet more �heat� and risk-taking then try to track down the Pavane CD (ADW 7387) of Mikhaïl Petukhov (piano) with the Buenos Aires PO/Alexander Anissimov - incandescent performances recorded live in 1993 and 1994. If you want recommendations for the Tchaikovsky 1-3 in studio versions then go for the EMI Gilels or if you want something with eccentric character then opt for Postnikova and Rozhdestvensky on Universal-Decca. This Gemini series is proclaimed as the vehicle for the �EMI Treasures�. In the case of the Second Concerto this is not hyperbole. As for the rest everything is enjoyable though has been bettered elsewhere in a field crowded with competition. The standard price for this set in the UK is �8.50. In fact you can order these Geminis from Amazon at �7.99 a piece; less than four pounds a disc. EMI strike back at Apex and Regis. The listeners benefit.